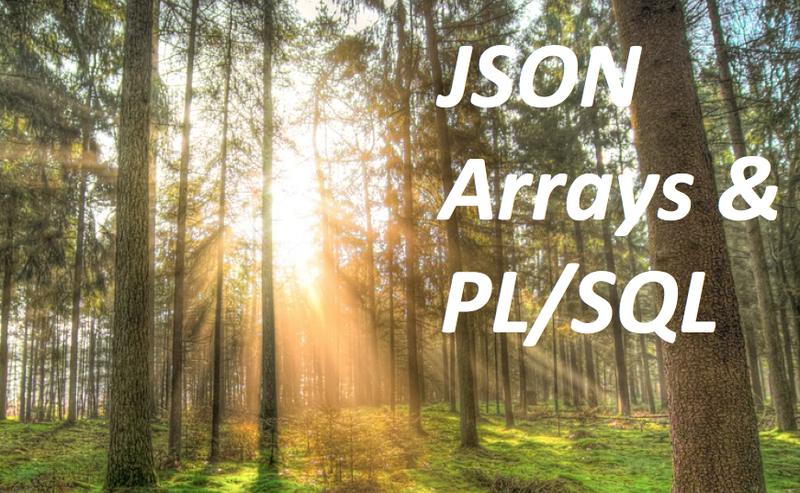 The index for a JSON array starts at 0, which is different from the norm for PL/SQL collections (nested tables and varrays start at index value 1). So the array shown above has elements defined at index values 0 and 1, not 1 and 2. The ordering of elements in an array is significant, in contrast to objects, in which the ordering of members is not significant (similar to relation tables). To demonstrate append, I created a "to JSON" package that converts a string-indexed associative array to a JSON array (it also contains other "to JSON" functions; try it out yourself with this LiveSQL script). where index-value is the string index value in the associative array, and item-value is the value of the item at that location in the array. Here's the package specification; note that the associative array is indexed by a subtype, INDEX_T, which is defined as VARCHAR2(50). Accept an associative array, return a JSON array object type instance. Since this is a string-indexed collection, I cannot use a "FOR indx IN 1 .. array.COUNT" approach. Instead, I start with the lowest-defined index value (retrieved on line 13 with a call to the FIRST function) and use a WHILE LOOP. Call the JSON_OBJECT_T append member method to add an element to the end of the JSON array. What am I adding? A JSON object that is constructed from the associative array index and item, using the to_json.to_object function. Find the next defined index value (remember: strings!). The NEXT function returns NULL when going past the last index value, and that will stop the WHILE loop. Time to run some code! Notice that the items in the JSON array are not in the same order as they appeared in the qualified expression that populated the associative array. That's due to the automatic ordering by character set order when values are put into a string-indexed collection. Some JSON arrays are simple lists of scalars, or even objects. But many arrays have within them other arrays. And with these arrays-with-nested-arrays, you might want to iterate through all the "leaves" in that hierarchical structure. The easiest way to do that is with recursion. Let's build a procedure to do just that. All the code in this section may be found, run and played around with on LiveSQL. My version of DBMS_OUTPUT.put_line is used in several places in the json_array_traversal procedure, shown below. Pass in a CLOB containing a JSON document, which for this procedure should be an array. The actual value for the "leaf action" parameter is a dynamic PL/SQL block to be executed when a leaf is encountered. It is unlikely you would use anything this generic in production code, but it could be very handy as a utility. Define a number of instances of JSON object types: an array, an object, key list, and element. OK, then I display the document passed in, taking advantage of the stringify method. An element in an array can be a scalar, object or another array. So I provide a WHEN clause for each possibility. Well, not each and every. There are more types of scalars than string, but I leave the expansion of the CASE statement to cover all scalar type to my dear readers. If the element is a scalar string, then I use native dynamic SQL to execute the provided PL/SQL block. I pass to the string value (by calling the get_string method for that index value) and the level (so that the entry is properly indented in the output). 1. This element, cast to an array, and then converted back to string format. 3. The level, raised by 1. JSON arrays are widely and heavily used. They are also extremely flexible, as they can contain scalars, objects and other arrays. The more complex and nested is the structure of your JSON array, the most challenging it can be to work with.